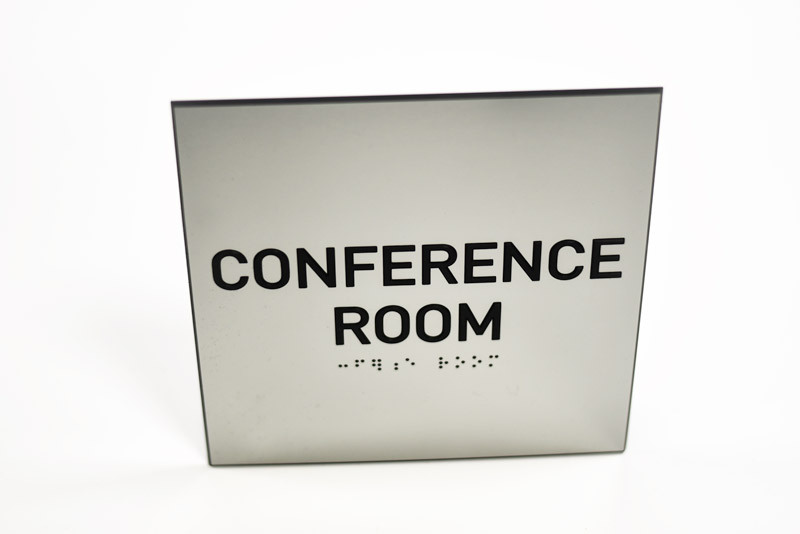 ADA compliant braille signs (1/8" thick) with a simple beveled edge include grade 2 braille and 1/32" tactile (raised) text. 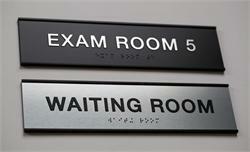 Create matching signs to post throughout your corporate office building, clinic, hospital, school or shopping center. 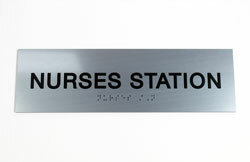 Personalize these signs with any text you require at no additional charge. 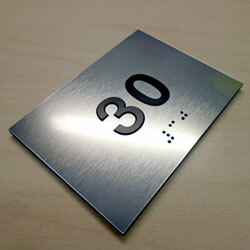 When we review your order, we'll check the text and make sure the number of characters entered complies with ADA guidelines for the size of sign ordered. If not, we will contact you with the size the sign would need to be to accommodate the text, along with the updated price. 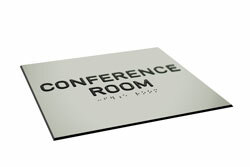 These signs are great for labeling conference rooms, meeting rooms, break rooms, employee offices, exam rooms and more! If you don't see a size you need listed, contact our customer service team via e-mail at service@officesigncompany.com or via phone at (701) 526-3835 with all of your details. 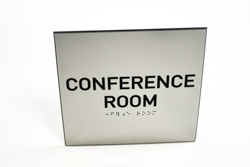 Note: If choosing Brushed Stainless Steel with Black Lettering, Brushed Gold with Black Lettering, Brushed Copper Penny with Black Lettering, or Cashew with Black lettering, beveled edge will be black (as shown in main photo). 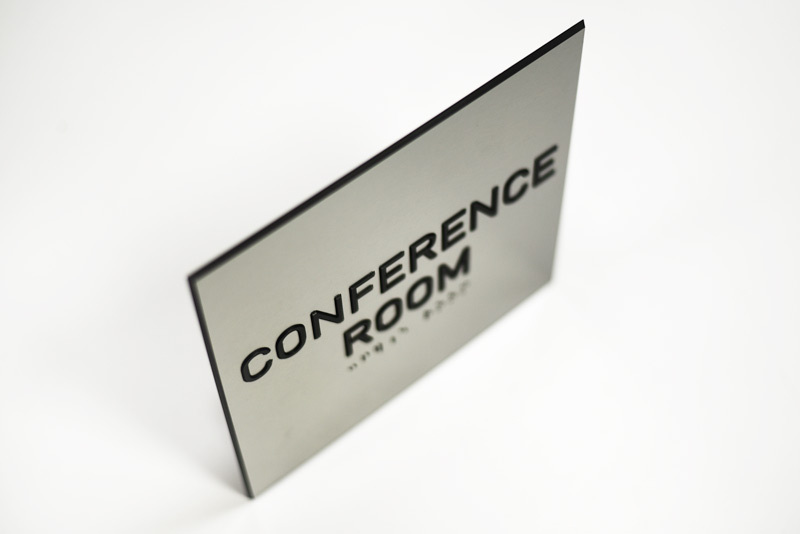 On any remaining standard color options, beveled edge will be the same color as the sign face. 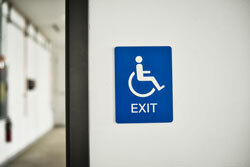 6" x 8" ADA Braille Accessible EXIT sign with 1/32" tactile (raised) text and wheelchair graphic with grade 2 braille. Available in many types of finishes including brushed metal and wood tones. 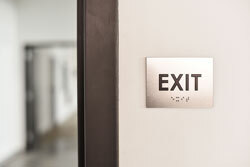 ADA compliant EXIT sign with grade 2 ADA braille and 1/32" tactile text/graphics. 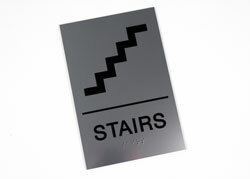 Choose from a variety of two-color combinations and finishes.